Some time ago I talked with a good friend of mine about Knights Hunt. He said, I should move away from the chess-like board. Another nice type would be a hex-board. That time I rejected the idea, but the brain can usually not stop thinking about stuff. Basically, the shape of the board is not important. 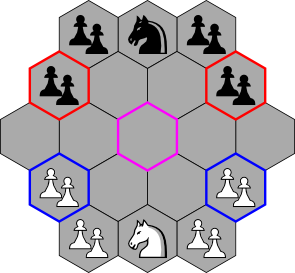 The way knights move seems easy to transfer to a hex-board (1 field straight + 1 field diagonal => 1 field straight + 1 field in a neighboring direction). 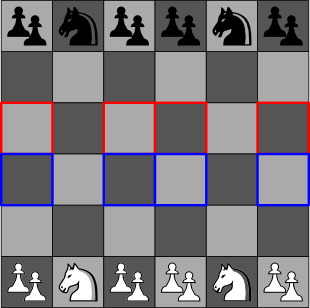 The knight loses some freedom in its movement (on a chess board there are 8 reachable fields, while on the hex-board there are only 6 reachable fields.) but that is not a problem. However, if you take a closer look, you will see, that there is a very huge problem! The knight can only reach 1/3 of all fields of the board. To fix this, the knight movement needs to be extended, either by allowing to move only one field or be allowing to move two fields in one direction. The solution is not clear to me yet. Let ignore this problem for now and stick to the classical movement. 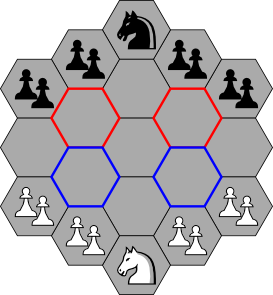 One possible hex-board for an adjusted game. 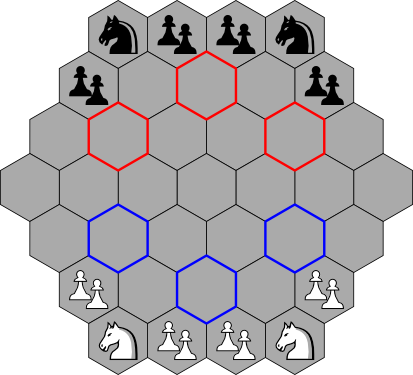 The fields with colored border are the fields the knights can reach in their first move. One further problem is visible: the reachable fields are further apart on the hex-board. This means that the meeting of the knights will need more turns and thus that the games evolve slower. However, Knights Hunt was designed for a fast game play. Thus, I do not like this. Now, this looks nicely lilke the classical scenario (using the classical knight moves, which will not work). However, the second move (the first black move) is again a huge problem. Concolusion: The hex-board simple do not work that way. I like the idea to simplify the game by only using one knight and I will continue to think about it. However, the result is likely a completely new game.